Net Surfing for Those Unable to See. Ellen Ringlein of Baltimore clicks efficiently with a cane through strange hallways. She tours alien cities without the help of a seeing‑eye dog or anyone else. And yet in the comfort of her own office Amazon.com seems impossible to navigate. 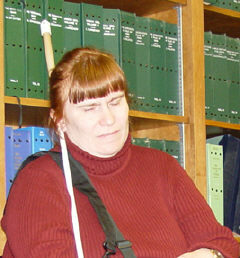 Earlier this month Ringlein spent a half‑hour on the Web site trying to locate the audio version of the book her church club was reading, but the speech‑synthesizing machine [more accurately, software] she and other blind people use to surf the Net just rattled minutes of gibberish. "Image maplink ref equals!" it barked. And "blankblankblank!" The Web site offered no easy way to avoid this nonsensical spiel, which was mostly a narration of the links at the top of the page, Ringlein said. And even when she finally discovered where to type in the title she wanted, the results were hard to decipher. "OK, now they're talking about delighting your valentine," she said, as the computer spat out an advertisement. "I just want to know how much the audio book is. I know it's here, but I can't find it." Actually the screen wasn't even displaying the correct page. Frustrating experiences like this are why one Towson University professor recently partnered with the Baltimore‑based National Federation of the Blind to map the struggles of the blind online. Jonathan Lazar is studying how the Internet fails blind users and will share his findings in the summer with Web masters and software designers, who aren't legally compelled to make their products accessible, but could change lives by doing so. The study follows a hundred or so users in Baltimore and elsewhere as they perform everyday functions online: buying additional cell phone minutes, checking email, browsing CNN.com, downloading music, researching medical problems, looking for Delta Air Lines tickets‑-basically stuff that everyone else does on the Net. But navigational problems eat huge chunks of blind people's time, Lazar is finding, and technical nuisances like spam, pop‑up advertisements, and security checks hinder searches. "What is annoying to a visual user becomes impossible for a blind user," said Lazar, who is the head of Towson's Computer Information Systems Undergraduate Program. Most of these obstacles can be overcome, he said. "It's not the disability that causes the hardship. It's the way the technology is designed." His study identifies precisely when Web sites fall apart for blind users and how much time and energy they waste figuring out problems. Because the Internet allows for electronic commuting, communication, and commerce, it has opened doors for most disabled people, but threatens to close some for the blind. "The Internet is designed for visual people, fundamentally," said Betsy Zaborowski, who runs the NFB's research and technology training institute. Only about a quarter of the 1.1 million blind Americans use computers, and of these, many experiment with the Internet only in limited ways, Zaborowski said. Partially this is because blind people are often older and not techno‑savvy, but it's also because the graphic‑centric Internet is not designed for them. And yet it's vital that everyone have access, she said. Already there is a 74 percent unemployment rate among blind adults. If the blind don't adapt to the Internet, they'll lack vital job skills. But first the Internet must adapt to them. Unintentionally Web masters often shut blind users out of their sites. Of fifty Baltimore‑based Web sites forty-nine had accessibility problems, Lazar found in a 2003 study. To navigate the Internet, blind people use screen readers-‑speech‑synthesizing machines that narrate text at auctioneer‑speed-‑or Braille keyboards, which transfer information into bumps that rise and fall beneath the user's fingertips. Though useful, these devices have online limitations. They can't interpret graphics like pictures and logos, and they can't scan. Instead they read every word of text, rattling off links that a sighted user could dismiss with a glance. But site designers can layer captions beneath pictures and add shortcuts that bypass superfluous links. These sanity‑saving adjustments are usually encoded behind the scenes and don't change the Web site's look, Lazar said. The reconfiguration wasn't hard, said Kristen Cox, secretary of the state's Department of Disabilities. "Nonvisual accessibility is not a problem if people are clear about the specifics to make sites compatible with screen readers," she said. "In most cases, if it's built in, there's really no new cost." In the private sector, though, it's usually up to individual Web masters to embrace the accessibility guidelines, because federal courts haven't ruled definitively on whether or not the Internet is a public space that must be available to everyone, said Daniel Goldstein, a lawyer for NFB. Thus awareness‑raising must fuel reforms, and Lazar said that his research will alert designers to trouble areas. "The electronic infrastructure is being built today," he said. "If we miss this, we won't have jobs, we won't have opportunities, we won't have normal lives." It's disturbing that some of the least‑accessible sites are operated by Web companies, Lazar said. But he believes that the changes that make Web sites navigable for blind people will also benefit the sighted. For instance, he said, many of the accessibility modifications will also help display Internet information in alternative formats, like cell phone screens. More important, though, the modifications are "the right thing to do, the respectful thing to do," he said. "This is something we can do to make people's lives better." To doubters, he offers this challenge: "Turn off the graphics in your browser and try browsing your favorite Web site."